The following companies give tremendous support to our Association via paid sponsorships. Please consider using them in the event you require any of the services they provide. Jay Foran with Sage Settlements is a plaintiff loyal structured settlement planner who has been proudly serving the D.C. Bar for more than 15 years. In addition to complex structured settlement planning, we also offer a full array of litigation support services including special needs trust integration, tools to maximize and defer attorney fee compensation, lien negotiation/resolution services and MSA's. 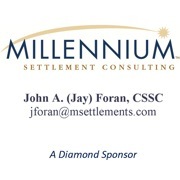 Please contact Jay Foran at jforan@sagesettlements.com or 410.721.8883. We are very proud sponsors and have enjoyed working with the DC legal community. We are dedicated and committed to bringing the most high level expert and valuation services in the entire country. Dr. Philip Marrion and Physician Life Care Planning are eager and excited to be able to work with TLA-DC again in 2018. At IWP, we view prescription medications as more than just pills in a bottle. As a specialized workers’ compensation home delivery pharmacy, we’ve made it our mission to ensure injured workers get the prescription medications they need to return to work as quickly as possible. As a vital part of the treatment team, IWP has an interactive relationship with all parties of the claim. We specialize in the state-specific nuances and complexities of workers’ compensation claims, helping to remove the administrative burden for you and your office along the way. By providing the highest-quality service to your clients with workers’ compensation claims, IWP allows you to keep your focus where it matters – your practice. To learn more about IWP, please visit our website at www.IWPharmacy.com or call us toll-free at 888-321-7945. Shared Horizons, Inc. is a 501(c)3, created to administer pooled special needs trusts in accordance with the Omnibus Reconciliation Act of 1993 (OBRA ’93). Our mission is to help people with disabilities and their families access an affordable Special Needs Trust option that will protect public benefits and provide goods and services while preserving their assets. Bell Legal Nurse Consulting strives to save you time and money on any of your cases involving medical records. Services include timelines, chronologies, case summaries, IME attendance, and expert witness services. Bell Legal Nurse Consulting can save you time by clarifying medical terminology and complex medical information concerning procedures, diagnoses, medications and treatments, and anatomy and physiology. We can quickly identify details contained within medical records that can save the legal staff time to focus on legal issues. Ring us for a free consultation at 410-660-7025 or 410-203-1817. Email her at marciablnc@yahoo.com and check out the website at www.marciablnc.com. Copyright 2013 by Trial Lawyers Association of Metropolitan Washington, DC. All Rights Reserved.